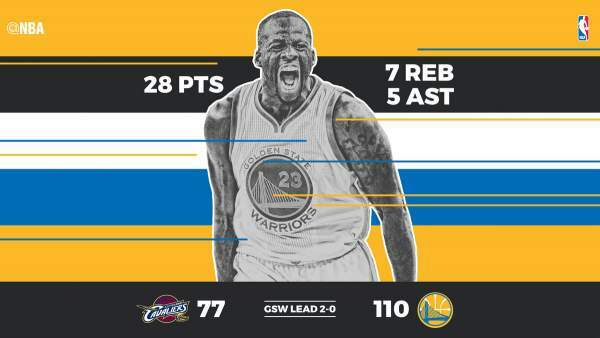 Game 2 Highlights: Warriors rout Cavaliers 110-77 (2016 NBA Finals) - Balita Boss! The Golden State Warriors routed the Cleveland Cavaliers in Game 2 of the 2016 NBA Finals, 110-77. Draymond Green led the Warriors with 28 points, seven rebounds and five assists despite limited input from unanimous most valuable player Stephen Curry, who battled foul trouble. Curry finished the game with 18 points on 7-for-11 shooting, nine rebounds and four assists. Klay Thompson added 17 points, made four three-pointers and five assists. Leandro Barbosa had another solid game with 10 points on 5-for-7 shooting. LeBron James finished with 19 points, eight rebounds, nine assists and four steals in 33 minutes, but committed seven turnovers and shot 7 for 17 overall and 1 for 5 from three-point range. Kyrie Irving only scored 10 points on 5-of-14 shooting. Kevin Love was hit in the back of the head by a Harrison Barnes elbow left in the third quarter with five points and three rebounds. He complained of dizziness and was placed on the NBA concussion protocol. Game 3 is Wednesday (Thursday in the Philippines) in Cleveland in a must-win scenario. No team in NBA history has ever come back from a 3-0 deficit to win a playoff series.